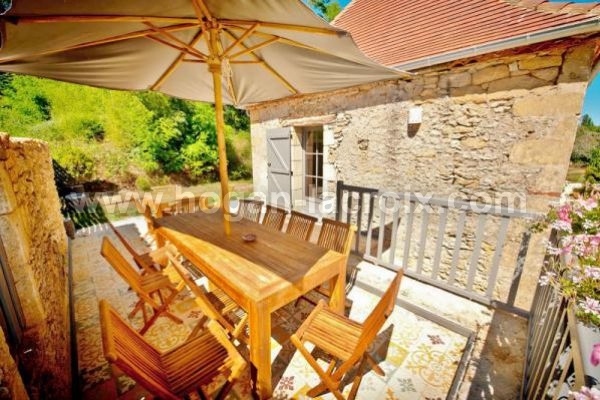 DORDOGNE VALLEY - BEAUTIFUL AND COMPLETELY RESTORED PROPERTY INCLUDING A MAIN HOUSE AND A GITE (12 to 14 PEOPLE.) 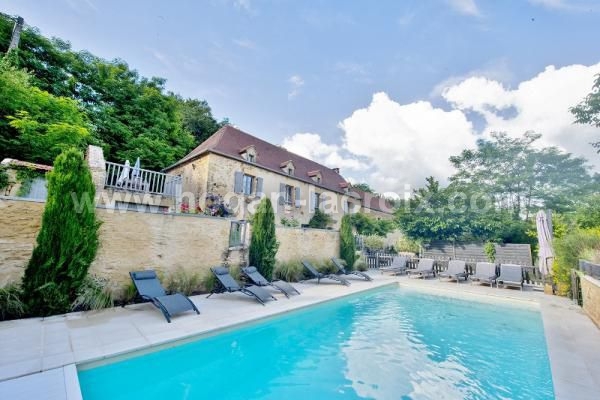 WITH BEAUTIFUL SWIMMING POOL ON A 3.70 ACRES LAND. REAL QUIET HAVEN AND RELAXATION SPOT... REAL CRUSH !!!! 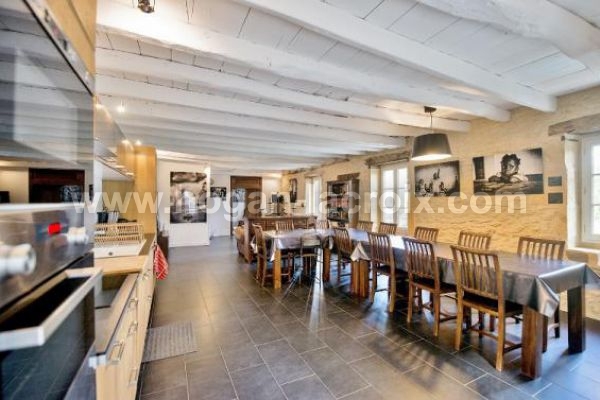 The former barn of the farm, completely rehabilitated in 2013: ground floor / hall with large cupboards 13 m², laundry-boiler room 10 m², large living room with open fully-equipped kitchen 57 m², WC 2 m². First floor / landing with lounge 18 m², 2 bedrooms one of which with dressing room (15.2 and 14 m²), shower room 8.4 m², study room 5 m² and WC. Convertible attic (authorization of building permit). 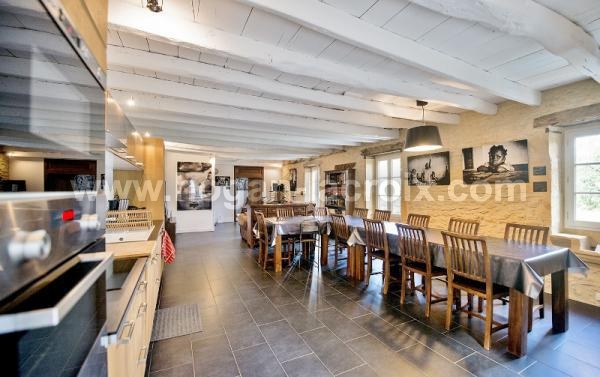 Adjacent to the barn, the house, on three levels : garden level / bedroom 1 with independent access with dressing room 17.2 m² and shower room with WC 3.4 m ². 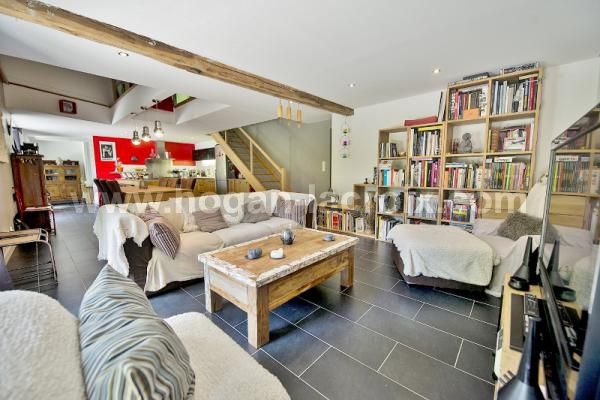 Living room 13 m², bedroom 2 with outside access 17 m² and WC 2.2 m². First floor / opened on a terrace for the hosts with barbecue, big living/dining room with open fully-equipped kitchen 56 m², bedroom 3 with shower room and dressing room 20.5 m², bathroom 5 m² and WC 1.7 m². Second floor /landing office - bedroom around 10.7 m², bedroom 4 14 m² and bedroom 5 with shower room 20 m². The farm and the barn both have lovely sights on the surrounding fields. On the park (3.70 acres), you can also find numerous outbuildings such as a pigsty, a forge, an old stone bread oven and a cellar, a well and two driveways giving a private access to both the house and the gite. Several private landscaped areas (swimming pool with solarium). Recent restoration- new roof and insulation - heat pump and underfloor heating with coolers in the main house with electric radiators upstairs - electric heating in the guest house with air conditioning in the last floor - septic tank up to current regulation - Heated swimming pool 10x4m with electric cover - Land Tax: 1500 €/year.